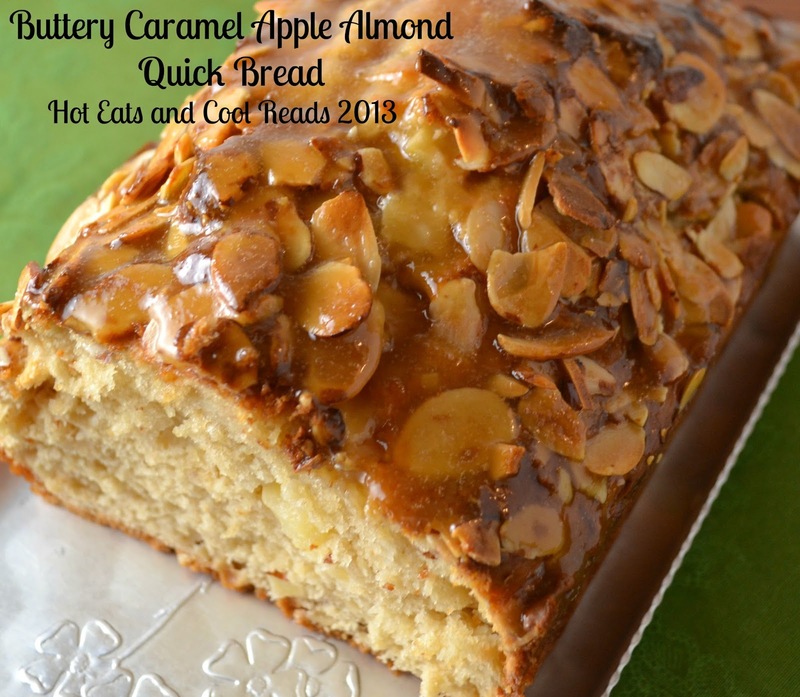 We love this delicious, fall quick bread for breakfast, snack or dessert! Perfect for the lunch box or picnic basket! I'm loving the gorgeous fall weather that's happening right now! My favorite thing to do lately is sit on the porch with a mug of tea, read a book and enjoy the breeze! Fall is by far my favorite season and I try to enjoy every minute outside that I can! Today's recipe is a delicious apple quick bread! With the abundance of apples everywhere right now, it's the perfect time to make this bread. We have plans to visit the apple orchard later this month, and I'm sure this bread will be made many more times before apple season is over. 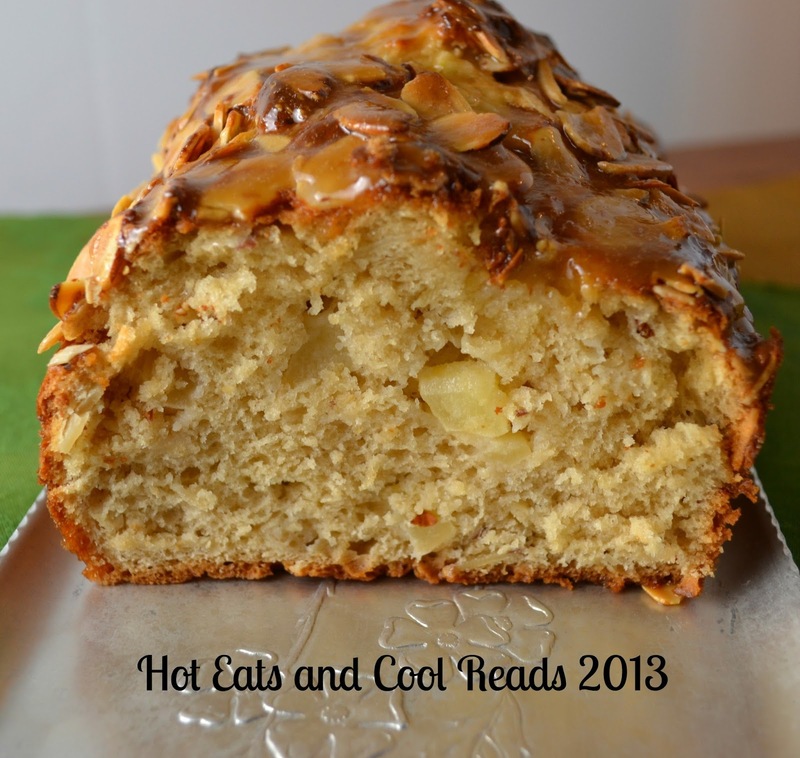 The chunks of apple throughout the bread are wonderful, and the caramel glaze on top gives the bread an extra sweetness! I slice the bread after it cools, and wrap each piece individually in aluminum foil so it's easy to take on the go, or pack in a lunchbox. What's your favorite quick bread? Lightly grease a 9x5x3 loaf pan and set aside. Using an electric mixer on low, beat together the sour cream, brown sugar, eggs and vanilla on low until combined. Then add the flour, baking powder, baking soda and salt, beat on low until well combined. Fold in the apples and 1/2 cup almonds. Pour the batter into the loaf pan and top with remaining 1/2 cup almonds. Lightly press the almonds into the top of the batter. Bake for about 1 hour, until toothpick inserted in the center comes out clean. Cool in the loaf pan for 20 minutes, then remove loaf and cool completely on a wire rack. In a small saucepan over medium heat, combine the butter and brown sugar. Bring to a light boil, reduce heat, and stir constantly for 1 minute until sauce starts to thicken. Remove from heat and drizzle over the top of the loaf. Those caramelized almonds on top look lovely. Visiting from The Weekend Re-treat. Thanks so much, Laura!! Glad you stopped by! What an amazing recipe! Looks mighty tasty. Thanks so much for taking time to link back to our Weekend Potluck party. Keep up the good work. It looks DELICIOUS and my family would just loooooooooooves it!! This sounds absolutely divine! I was surprised not to see any butter or oil in the batter. Pinning! I'll be trying this one for sure! I hope you'll link this up to our All Things Thursday Blog Hop that goes live on Wednesday at 8pm Central. WOW this looks just great!! Pinning now, and can't wait to try it this Fall - so perfect for the Autumn season :) Thanks for sharing! Thanks so much for pinning and stopping by, Hannah! Sheena, this looks absolutely amazing! Wow! Thank you so much for sharing and joining us at Best of the Weekend! Pinning to our party board! I hope you are having a fantastic week and see you this Friday! Stopping by from "The Better Baker"! Congratulations on the feature! Wow, this bread looks amazing! Thanks for sharing it with Foodie Friends Friday this week. Have a great day! Thanks, Sarah!! Glad you stopped by! I just printed out the recipe for this delicious bread! What could be better than caramel and appley butter flavors this time of year :) I can't wait to try a slice. Pinned!